three thumbs up for Noodlers!
" Noodlers reach into submerged holes, often several feet underwater, and wrestle out catfish that can weigh up to 100 pounds, with no hooks, rods or nets involved. It's called noodling because the fisherman wiggles his fingers like wet spaghetti to entice the fish to bite. When it does, the noodler sticks his arm down its throat and grabs it by the gills." "Noodling is the practice and sport of fishing for catfish using only one's bare hands. Noodling may be called catfisting, grabbling, graveling, hogging, or tickling, depending on region. (Kentuckians call it dogging, while Nebraskans prefer stumping). South Georgia writer Harry Crews, in his autobiographical novel A Childhood, uses the term "cooning" to describe the practice. Despite these colorful names, noodling is better explained by the name handfishing; however, this term is less popular among those who participate in noodling. Only four states in the United States have laws explicitly permitting handfishing: Louisiana, Mississippi, Oklahoma, and Tennessee. Missouri has an experimental noodling season in 2005 on sections of three rivers, from June 1 through July 15. Noodlers Anonymous argues that the season is doomed to fail, though, because these swimming pool sections are too dangerous, too crowded, or otherwise not desirable for the sport. 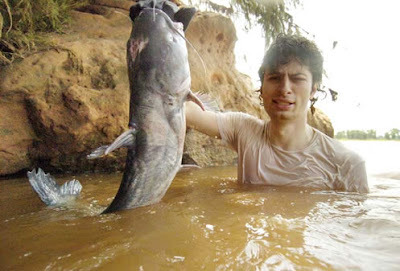 The term "noodling", although today used primarily towards the capture of flathead catfish, can and has been applied to all hand-based fishing methods, regardless of the method or species of fish sought. Noodling as a term has also been applied to various unconventional methods of fishing, such as any which do not use bait, rod & reel, speargun, etc., but this usage is much less common." This heightens my fear of fish with teeth lurking in the water ready to take a chunk out of me in fresh water. However, Noodler's ink with a picture of a catfish on the face of it's bulletproof black in makes the link. My goodness. I have loaded up my fountain pen and used a brush and this stuff is glorious, matte black, dense enough that I do not need a second go round on the black. Goes on smoothly, dark and in a single shot. Works well in the fountain pen initially and later in the day. I highly recommend this ink to try in your own work.